OK, boys and girls, I have a really cool treat for you. For a long time now I have been looking for the right application to use as a source code library. I say application because I have been trying to be open minded about what to use. I have tried Wiki’s (which actually aren’t too bad), note taking programs, and a great many other tools, including a couple that were specifically written to be source code libraries … but in the end fell quite short of my expectations. Also, when I say source code library, I am not and have not been looking for tons of canned code to take advantage of, that’s the problem I have now, 20+ years in IT and I already have tons of code, I just need a way to store it, sort it, search it, export it, back it up, and anything else I can think of! I’d like to note too that in addition to all of the other features I may list here, this tool does a superb job at syntax highlighting as well. Let me digress for a moment to mention a site called Donation Coder (www.donationcoder.com), these guys are great! Lots of free software from some really talented developers. There are some apps there that beat their commercial competition by a country mile, hands down. That’s one reason why I like to hang out there, in the forums for example, these guys write software because they enjoy writing software. Therefore they create some wicked cool stuff. How does this pertain to the issue at hand? Well, it was in the forums there that I ran across a thread where people were talking about their own search for a source code library much like my own search. I found one post among others recommending different things that mentioned a free tool called “Developer’s Tips & Tricks (DTT)” from Freesoftland. I had never heard of this group before, but I liked what I had seen posted in the Donation Coder forums, plus I really liked what I saw when reading up on their DTT tool. So, getting to the point, I tried the free tool and was duly impressed. In fact, I liked (and like) it so much that I made a donation to the site to show my support and gratitude. Well, that wasn’t the only reason, if you make a donation you can get a special version of DTT only for those who have donated to the cause that has more bells and whistles. A couple things that caught my eye regarding those bells and whistles was the ability to take a snippet of source code and export it to HTML, or a Word document (RTF) even. That’s great for documenting a project or sharing some code! It also enabled a robust search option. Now, aside from a great tool for collecting and managing your chunks of code (any language by the way), it does in fact come with loads of code snippets and functions already populated withing the database covering a wide array of languages. Can’t hurt to have some extra info right? All in all, I find myself using this tool rather frequently and the more I use it, the happier I am with it. I highly recommend this to anyone and everyone who has a need to store source code snippets, functions, and etc. Automatic (and manual) check for program updates. Character Set management to support translation into non-latin languages (i.e. Russian, Chinese, etc..). Customizable font and colors for tip editor. Drag and Drop support for tree view in order to copy or move tips between categories. Find (& Replace) edit functions. Full drag & drop support for both dragged files and text from other applications. Import Tip from external file capabilities. 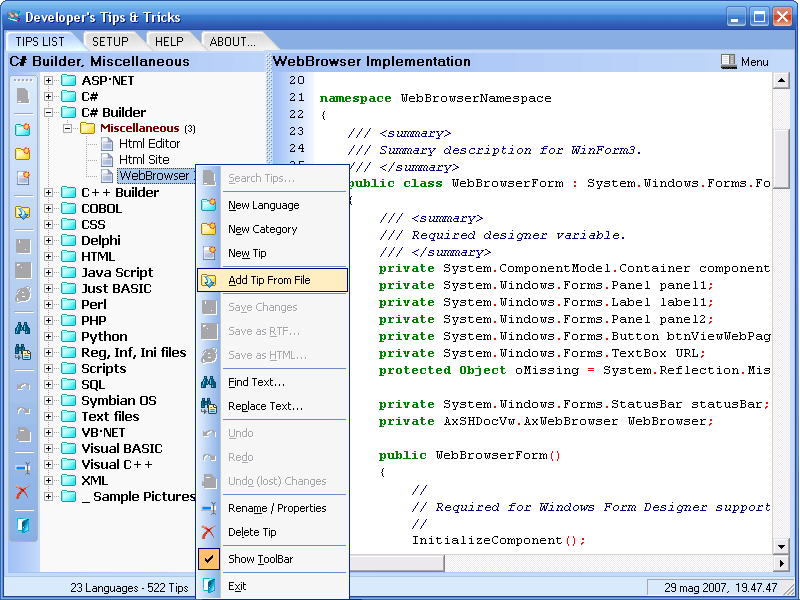 Integrated editor with syntax highlight features. Screen compatibility for Windows with Large Font (120 DPI). 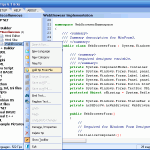 Support for Symbian OS source files (C compiler). Supported languages: BASIC (Visual, Just), C (Visual, ++, #), PHP, COBOL, CSS, Delphi (Pascal), HTML, .INI files, Java Scripts, Perl, Phyton, Script, SQL, XML and much more. Templates for new tips with Macro’s management for Header with automatic insertion for date, title, developer name, and more. Tips manager (create, delete, rename, edit, syntax properties, etc…). Work with Vista and windows 7. There you have it, so what are you waiting for? You have your orders, go check it out now! Previous PostVisual Basic dot NET – Making a button the form defaultNext PostQuick fix for Notepad++ and the dreaded “Error in CreateProcess (740)” problem! Just came across on your blog — very cool. And thanks for the recommendation of DDT, going to check it out.